NAM was a bit of a downer for IA chase prospects on Wednesday. Much less EHI than the GFS and doesn't develop the surface low up there nearly as much. However it's still early. use https://weather.us/model-charts/euro/ for the euro. 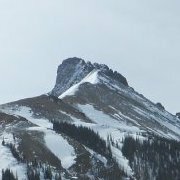 Its free and provides access to most parameters. The NAM (today's 18z run) is suggesting some potential for tornadic supercells near and east of DFW, albeit with some VBV issues, though like StormChaser4Life said, it's long-range NAM so take it with a grain of salt. GFS-based models show less EHI across the North Texas area, and would suggest more of a threat in East Texas. We'll see how Wednesday and Wednesday night involve in Texas, Oklahoma, east into the Arklatex. That VBV showing up at 0Z Thursday in the 0Z NAM is completely gone by 03Z. That VBV would result in a messy convective mode, but still, support a pretty significant hail threat with initial storms. Pretty good chance of a nasty QLCS into Thursday morning across Northeast Texas, East Texas, and Southeast Texas. We'll see just how much of a tornado threat can develop with that VBV. Big downtrend for Iowa with the 15% barely nudging into the SE corner of the state after most of the state being in the Day 4 30%. Looks like SPC is leaning more towards the NAM, which remains worlds apart from the GFS which has actually increased the EHI over the area on recent runs. Not impressed with this system as it gets closer, at this point not looking like a significant tornado event for anyone. Yeah, I read the outlook. The wording sounds like they expect mainly hailers. I had higher hopes for this setup when people were talking about how ominous it looked in the Day 8 or so range. I'll need to see the NAM come around some before I start feeling good again about my decision to take Wednesday off to chase. 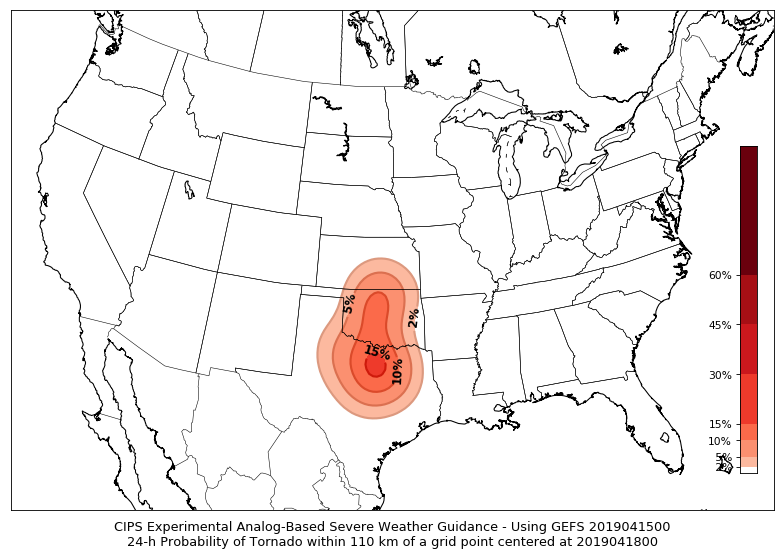 Despite what pattern recognition would tell you about a strong, negatively tilted trough ejecting into a moist and unstable warm sector this time of year in the southern plains... nothing is particularly enticing about Wednesday, at all attm... Perhaps we could get some supercell action in a sweet spot in OK or TX for a couple/few hours but that might not even happen given wind profiles that strongly favor messier storm-modes. GFS meanwhile seems to be sticking to its guns in depicting a much more robust severe threat over parts of Iowa Wednesday afternoon/evening...this one is gonna be down to the wire with both models basically locked in on their solutions for multiple runs. What a forecasting nightmare. About the only favorable factor I can find consistently across both models is very steep lapse rates in the warm sector, which most previous systems this year have been lacking. However as the NAM suggests that may be the result of an unbreakable cap. The Okc weather guys have started throwing each other under the bus big time. I am afraid if nothing happens all of them will end up busting a gut. Despite lack of impressive composite values (EHI/STP etc. ), synoptic pattern Wednesday evening over Iowa shown on 3KM NAM is suggestive (surface low with backed winds ahead of it, low 60s dewpoints nosing up to the warm front). Will continue to monitor, although would have dearly loved to see more model agreement by this point. Thinking is some sups initiating along dryline in TX bringing hail and tornado threat for portions of DFW and areas surrounding. Then dryline further south initiates and has a messy mode moving through TX and Louisiana slowly growing upscale moving through MS and AL. Right now definitely not the tornado threat we had last week but could rack up a couple QLCS tornadoes, especially in MS where dynamics are gonna be a lot better versus further west. Could help us keep average for this week in terms of tornado count. Thinking is some sups initiating along dryline in TX bringing hail and tornado threat for portions of DFW and areas surrounding. I'm starting to get a bit concerned here in Fort Worth. The 18z NAM-based and GFS-based models show the storm threat a bit later though (either in the evening or early overnight hours), so maybe if those verify that could temper things a bit. Both NAMs have a very notable weakness in wind fields around 800 mb or so which is destroying the hodographs all across Texas. Seriously, what even is this??? Yes, even without the obvious weirdness in the wind profile, that is why I always question a "PDS TOR" sounding when it has no quality "sig" analog matches. 12Z TTU WRF has a very minor weakness around 800-825MB in North Texas at 22Z, and has it gone by the time a MONSTER supercell hits D/FW at 23-0Z. Something to watch closely as without that VBV there will likely a fairly substantial tornado risk with Wednesday's event in Texas. Either way, bowling-ball size hail with the afternoon storms and a decent high-wind event with the QLCS that night are good bets. 0Z guidance is also indicating the increasing potential for afternoon initiation in East Texas well east of the dryline in the open warm sector. 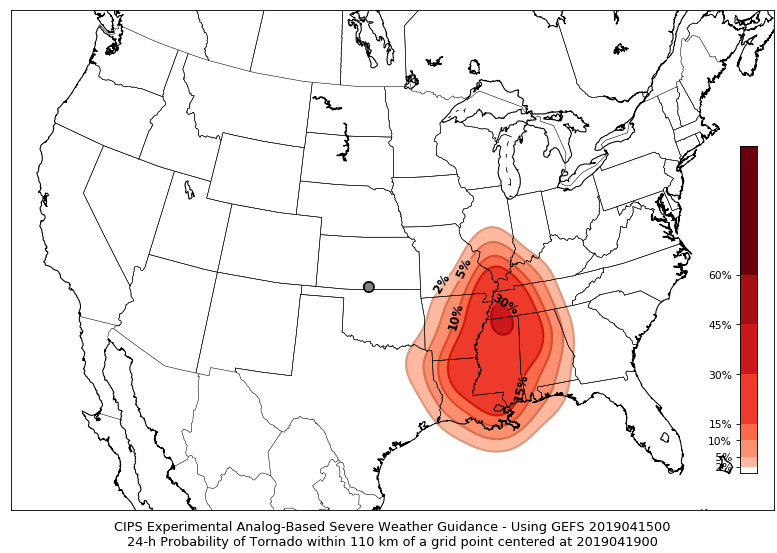 FWIW those would likely pose a tornado threat given the favorable thermodynamics and kinematics. Unlike farther west, I don't see much VBV out that way during the afternoon. I'm interested to see the 06Z and 1730Z SWODY2. I wouldn't be too surprised if they went with a small MDT for hail at some point in the next day in North Texas/Southern Oklahoma (Texoma). SPC sticking with an Enhanced Risk for Day 2. Northern edge of the 30% hatched zone shifted north to include OKC now as well. The entire 30% hatched zone encompasses the I-35 corridor from OKC to Austin. Sig hatching is for hail per the maximum risk by hazard section of the outlook, but they also mention 10% TOR probabilities (non-hatched) as a maximum risk too. One of the weirdest wind profiles I've ever seen. If you just looked at the 850-500 crossover you'd think everything was hunky-dory. Where the hell are those southerly winds from 850 up to 700mb coming from? Meanwhile the 3KM NAM paints a rather enticing wind profile over northern Illinois, although it doesn't break out any convection there through dark. 12z HRRR. Besides any tornado threat, at least a significant hail threat for DFW. The profiles are awful in the 850-700 mb layer all across the outlook area. 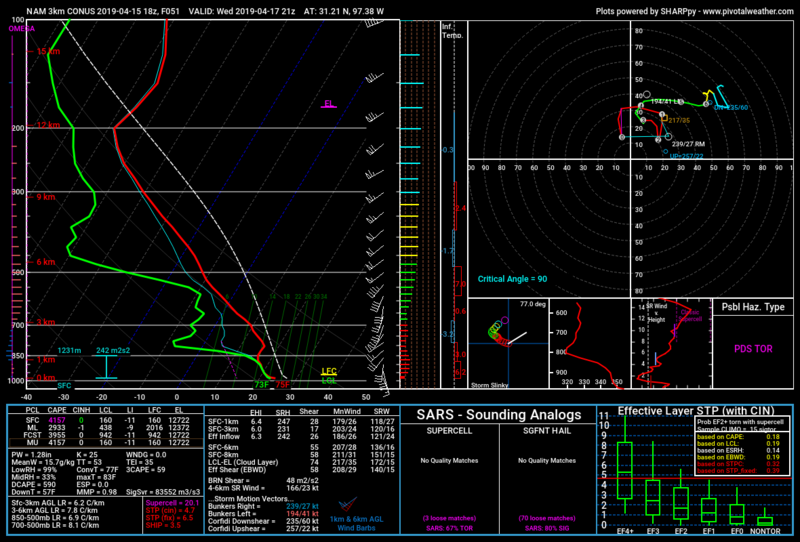 Struggling to find anywhere that looks decent for tornado potential tomorrow. Small pockets here and there with slightly better mid level flow but I don’t think the models will get such fine scale details right with any lead time. Overall this system is just disjointed and you see that with all the odd looking model soundings. I wouldn’t rule out a tornado or two somewhere in the region but I also wouldn’t be surprised if we saw none at all and end up with some pretty messy storm modes.